Our adoption pages are Always up to date! Our rescued Ducks & Geese deserve the safety of a predator-proof pen. Please review our Adoption Requirements carefully BEFORE completing our Online Adoption Application. Jabberwocky was rescued from a pond where he was hungry and exposed to freezing cold temperatures and predators. Yolanda was removed from an unsanitary situation involving overcrowding. She was the only solo goose there, so her owner surrendered her to us, so that she could come here. Upon being introduced Jabberwocky and Yolanda fell madly in LOVE! We love picking Jabberwocky up and carrying him around with us and he thrives on all of the attention. He is a very special, very friendly boy who loves to be held and cuddled and kissed. He also gets along with ducks and is very protective of them. Jabberwocky talks a LOT and can be very LOUD, so he won't work out in a home with neighbors close by. Jabberwocky underwent cataract surgery in 2014. Because they do not replace the lens, his distance vision is better than his up-close vision; even so, he can see up-close, it's just blurry. He follows Yolanda around everywhere and has no trouble getting around as long as his pen is free of tripping obstacles. As with any visually impaired waterfowl, it's important to keep locations of items in his pen generally consistant. 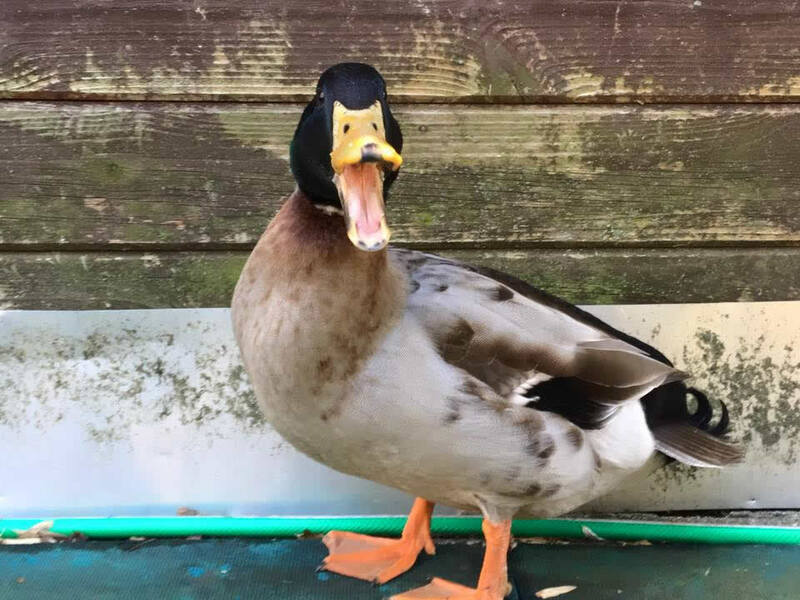 Bruno was abandoned on a pond where he started hanging around with a flock of Mallard ducks. A rescuer caught him and bought him to our sanctuary in November of 2017. Bruno is relatively shy, but we're working on building trust with lots of treats! One of the really great things about Bruno is he's been very good with other single males. He was best buddies with Lincoln (Pekin) before he was adopted and the moment we brought little Uni out to his pen, the two became best friends within minutes. Bruno is just a really easy-going guy--he even behaved himself during spring fever. This isn't to say he wouldn't really love a girlfriend to love and call his own, but if you have a single boy needing a friend, this guy would likely be a good one.